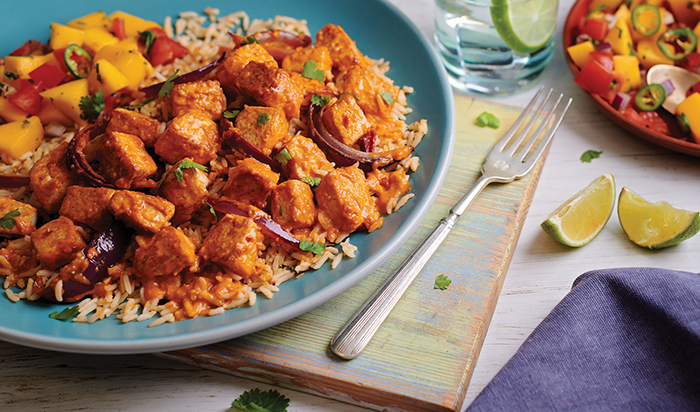 Enjoy an explosion of flavours with this delicious, tangy Costa Rican tofu curry. Served with a zingy mango salsa for a proper feast! Heat the cooking oil in a frying pan. Add the tofu and sliced red onion and fry over high heat for 5 minutes (or based on instructions on tofu packaging). Reduce the heat, add the contents of the Coconut Adobo Sauce sachet and stir well. Simmer for 2 minutes, or until fully cooked. For the mango salsa, chop the ingredients into very small slices or chunks. Mix together in a bowl and season with fresh lime juice. 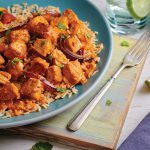 Serve with Santa Maria Coconut & Chilli Rice, cooked according to the packet instructions, garnished with fresh coriander and mango salsa on the side.